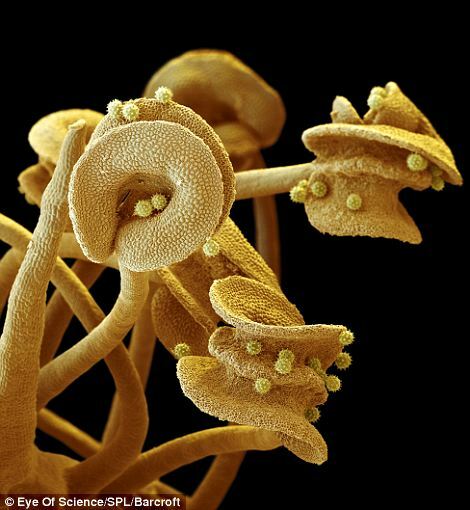 Flowers in bloom are one of the great joys of spring, but when viewed under a colour scanning electron microscope (SEM), they reveal an even greater surreal, alien-like beauty. 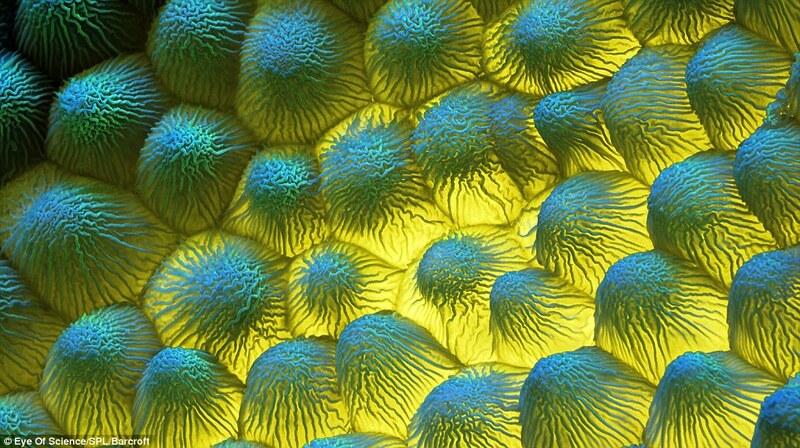 From rose petals to arnica stigmas, and hibiscus stamens to pollen grains, a German photographer has captured the images with the help of a biologist from the German microscopy team at Eye of Science. The process of preparing the flowers to be photographed takes days of meticulous drying and coating in order to capture the beauty without the samples disintegrating. 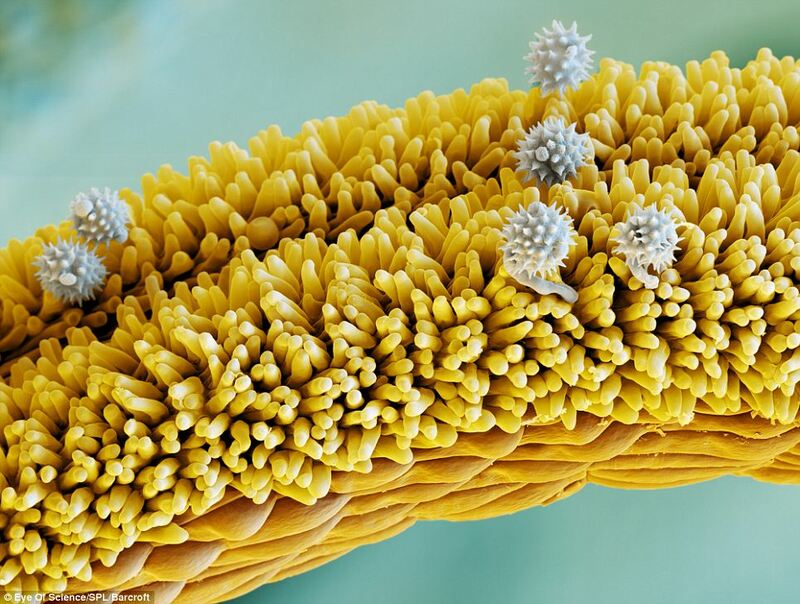 ‘Flowers are beautiful in "normal'" view, but when you look closer, some parts get very bizarre and unexpected structures appear - flowers within flowers, worlds within worlds,’ Meckes said. For a decade the pair, based in Reutlingen in the south of Germany, worked with an SEM they saved from the scrapheap, but for the last five years they have used a £250,000 FEI Quanta Series Field Emission SEM. The breathtaking shots show that these floral displays did not evolve to please our human senses, but instead serve the single purpose of attracting insects that will help pollinate the plant and allow it to reproduce. To prepare the specimens, Meckes and Ottawa took small pieces of each flower petal or leaf and put them through a dehydration process, before immersing them in 100 per cent alcohol. Later, the alcohol was replaced with carbon dioxide in a pressure chamber to carry out what the team called the ‘critical-point’ step of the drying process. 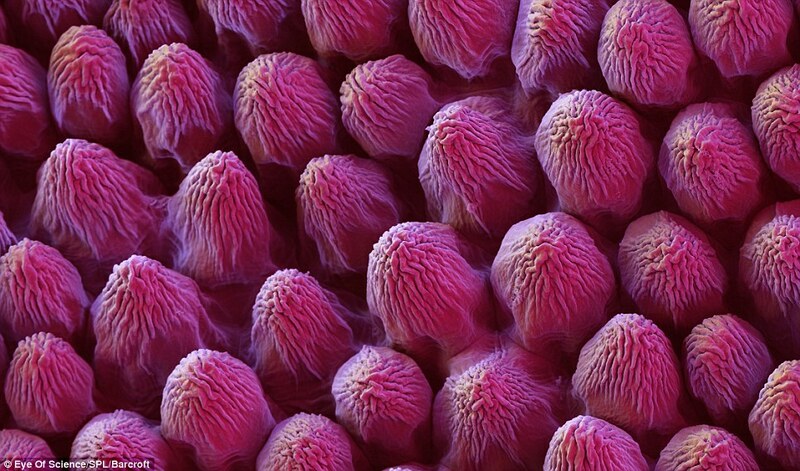 This meticulous method has been designed to maintain the appearance of the the sensitive and delicately thin surface of each plant - without which, the cells would collapse and the flowers would disintegrate. After being mounted on an aluminium platelet, each specimen was then coated in gold before being photographed. 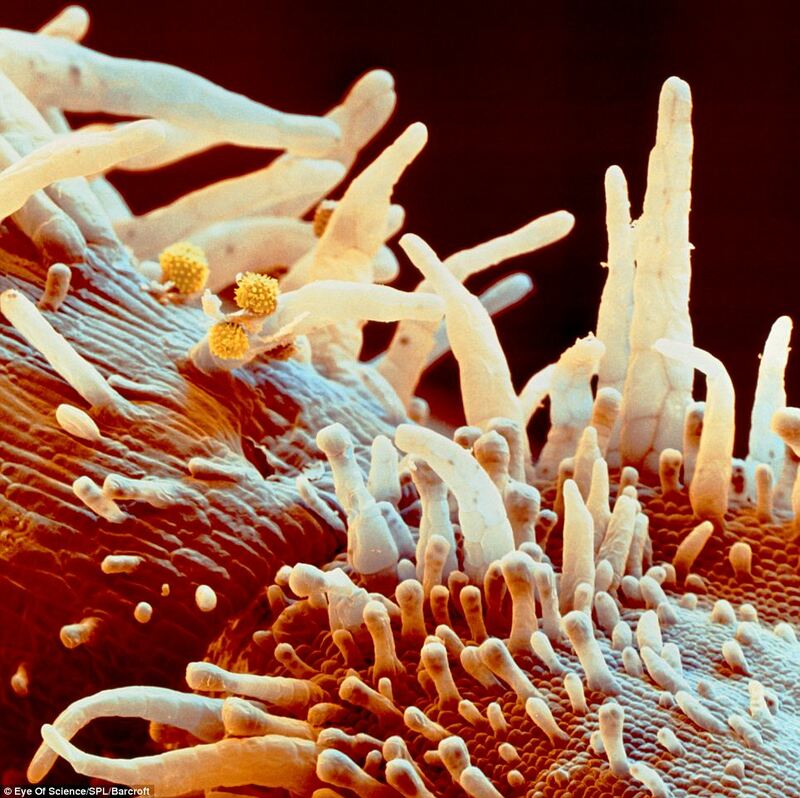 In one image, a close up shot of a rose petal resembles rows of raspberries, while the surface of a rapeseed flower looks like the scaly skin of a lizard or snake. 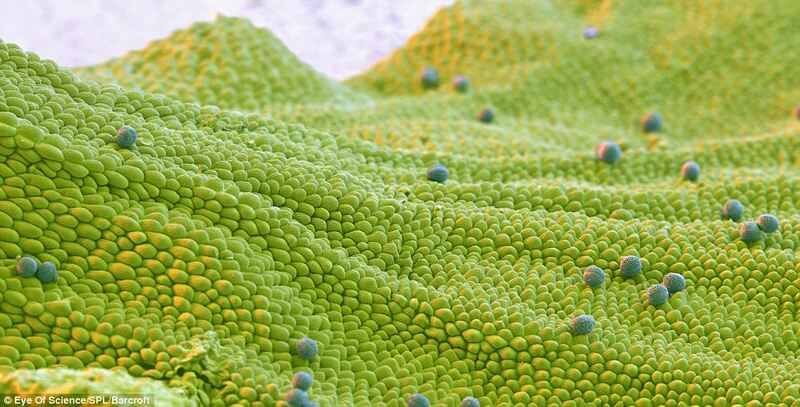 Another shot taken of a rapeseed leaf, with the light hitting the specimen from behind, makes it appear like a section of coral deep under the sea. 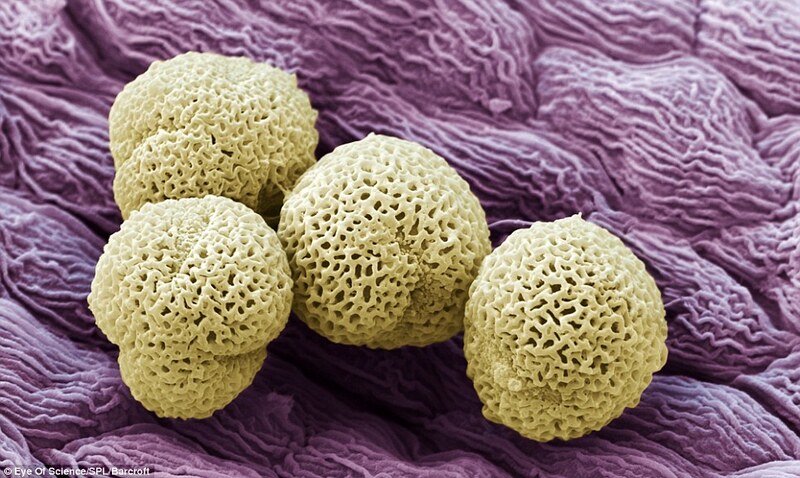 In two of the images, Meckes and Ottawa capture pollen grains sat on the petals of arnica and lilac flowers. 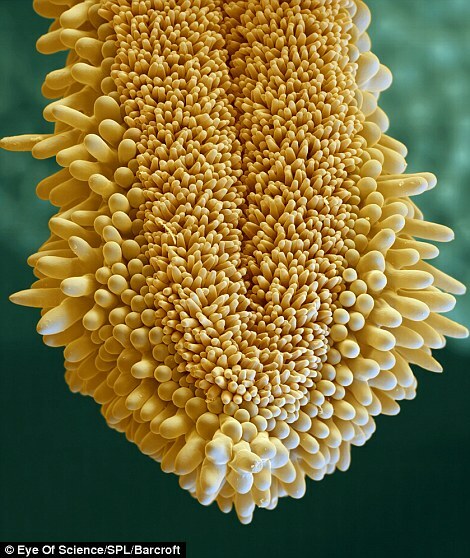 The arnica image resembles bacteria and its grey pollen grains look menacing with their sharp edges. 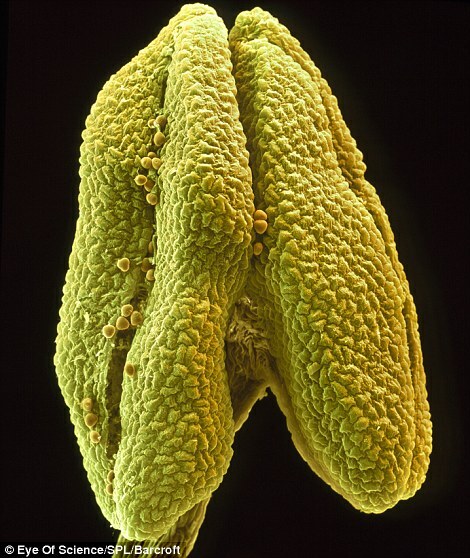 By contrast, the pollen of the lilac is yellow and round and resembles the human brain. The stigma of the same arnica specimen in a separate image looks like a spiky tongue. 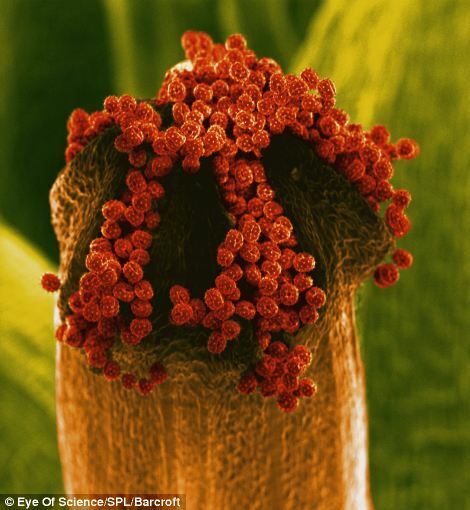 By stark contrast, the pollen of the coltsfoot flower is shown as bright red, and resembles cod roe. 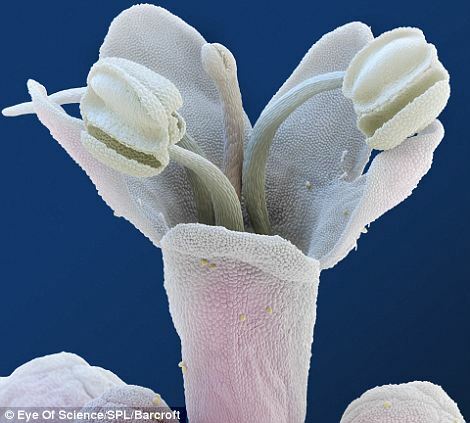 The pair have previously used their SEM to take artistic images of bacteria, parasites, and butterflies to herbs, water bears, plant poisons and silverfish. 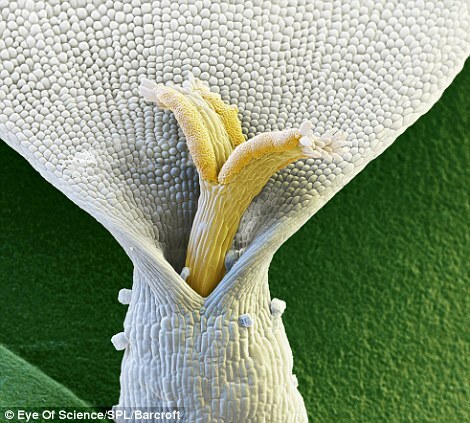 ‘Working in the microscopic dimensions has completely changed our view of the world,’ Meckes said.